Tip: Boneless chicken meat or pork tenderloin can be used instead of beef tenderloin. 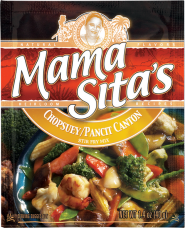 Marinate meat in Mama Sita’s Barbecue Marinade for at least 30 minutes. In a wok or frying pan, heat oil. Sauté onion and beef until slightly brown. Add water and spinach and cook for three minutes. Season with salt and pepper. Pour in the dissolved cornstarch, stirring continuously until sauce thickens.